Welcome to the Physician page – a collection of important resources for physicians and medical learners at Hamilton Health Sciences, as well as healthcare providers in the community. Annual Reappointment Applications were due Friday March 8, 2019. Please contact the Credentials Office if you have any questions. HHS has introduced a new Behaviour Safety Risk Communication and Care Plan Program to meet the health and safety needs of physicians, learners, staff and patients. To learn more, visit the BSR Protocol intranet page (requires Citrix access) or, click here for more information. Hamilton Health Sciences is home to 18 Clinical Departments servicing 2.3 million residents of Hamilton and South Central Ontario, Canada. To find out more information about each department, the Chief and other important information, please browse through each of the department pages. If you don’t see your department’s page listed, please connect with your Chief’s Office. The Credentials Office provides services to support the relationship between Hamilton Health Sciences/St. Joseph’s Healthcare Hamilton/Niagara Health System and the Credentialed Professional Staff (physicians, dentists & midwives). The office supports the administration of new appointments, reappointments, and observers. Learn more about appointments and observership. Fit Tests are valid for 2 years. To book an appointment, please visit the HHS Intranet, click on Health Safety & Wellness, Select Safety Services and click N95 Fit Testing Clinic on the right hand side. The Medical Advisory Committee (MAC) is accountable to the Board of Directors in accordance with the Public Hospitals Act. The committee is in place to promote the highest standards of medical care and professionalism throughout the hospital. View the Medical Staff Organizational Chart. The MAC also facilitates the development and maintenance of Rules and Regulations, Policies and ethical guidelines and procedures related to the roles of the Professional Staff. The Chair is appointed by the Board for a 3 year term (renewable once). The Chair will provide leadership in the establishment of an interdisciplinary approach to patient and family-centered care and service and work to create an environment that promotes commitment to continuous improvement of patient outcomes. The role is defined by both the Public Hospitals Act and our Corporate Bylaws. The Chair of the MAC is a member of the Board of HHS and a number of quality and policy committees throughout HHS. Currently, the position is held by Dr. Paul Miller. Paul is an Emergency Physician (FRCP 2006) and also works in Palliative care. He is the co-director of Medically Assisted Dying at HHS. His training includes a Masters in Health Administration (Toronto: MHSc 2007) and executive leadership training at Rotman. He has a Green Belt in LEAN quality improvement. All eligible Medical Staff are automatically granted membership to the MSA, for the duration of their Medical Staff status at HHS. Learn more about the Medical Staff Association. Implement mechanisms, tools, and resources to enhance physician engagement. Ensure that HHS and the Medical Staff have a partnership based relationship. Create mechanisms and systems to ensure that the expertise of our physicians informs organizational decision making, in a model of shared accountability. For HHS and the Medical Staff to action on identified priorities related to making HHS the workplace of choice and a great place to practice medicine. 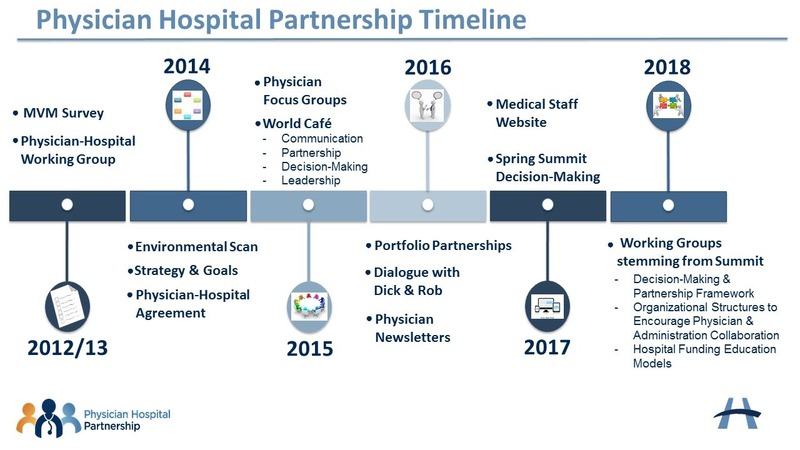 View a timeline of the Physician-Hospital Partnership work. On April 10, 2017, the Physician-Hospital Partnership Group hosted the Spring Summit: a discussion on collaborative decision-making. The evening brought together physicians and hospital leaders at Hamilton Health Sciences to better understand how we can be more collaborative in decision-making at our organization. For a complete summary of the evening, please see the Spring Summit Summary Report. Want to get involved? email php@hhsc.ca. This group will work to understand how to align the organizational chart for HHS with the physician leadership and departments. We have heard that there is an opportunity to improve navigating the system and supporting more opportunities for collaborations. The working group will discuss what this should entail, how we will create a tool, document or other recommendations, and in what given timeline. This could include a current listing of 4 or 5 key committees per portfolio or perhaps a larger view of committees, to allow physicians to connect with the chairs to participate in some capacity. There may be a way to provide options on ways to involve physicians, and at a minimum, help to indicate the structure to allow easier navigation for physicians when they identify opportunities. The group will work on options, and ideas, stemming from all discussions at the Summit. This group will work to understand and determine what the framework might look like, and how we facilitate decision-making and partnership with physicians within our organization. This work stems from the Staffing Models, Clinical Service & Planning & Equipment discussions at the Summit. This group will work to understand how we can engage physicians and deliver educational tools to increase awareness and understanding of Hamilton Health Science’s funding model. This work stems from the Budget, Equipment, Staffing Models & Clinical Service & Planning discussions at the Summit. Accreditation sends a strong signal to our patients and our community that Hamilton Health Sciences (HHS) is deeply committed to safety, quality and operational excellence. Just as important, accreditation also provides critical feedback in the continuous improvement cycle at our hospital. Every four years, the accreditation process recognizes what we are doing exceptionally well and provides guidance on what we can do better. HHS was proud to achieve “Exemplary Standing” with Accreditation Canada in 2011 and 2015. We are now pursuing our third consecutive ‘Exemplary Standing’ with Accreditation Canada in 2019. The onsite visit will take place June 17 to 21, 2019. Please take the time to learn more about how you can be prepared. HHS is proud to recognize and celebrate our nearly 1300 physicians who are incredibly dedicated to providing exceptional care to our patients each and every day. Send in your Thanks Doc! e-card! 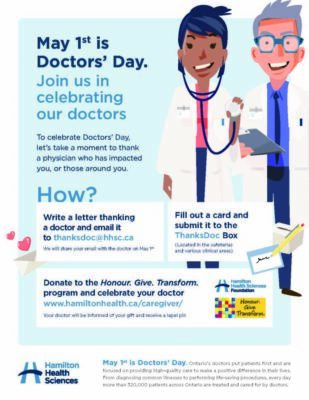 Submit your note of thanks to any of the Thanks Doc! Boxes from March 15th through April 20th. 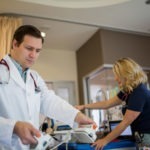 Hamilton Health Sciences is proud to partner with McMaster University’s Faculty of Health Sciences to offer a unique academic environment for medical students and residents to learn and provide highly skilled care to our patients in the process. If you are unsure who to contact with your questions, you can contact the Medical Affairs team at resorient@hhsc.ca or at ext. 44281. Please see our Things to Know tip sheet for important information for residents! Residents are paid by Hamilton Health Sciences, and as such are considered employees of the organization. Residents can access personal information & pay slips via myHR – HHS’ online HR system. …please contact Human Resources at myHR@hhsc.ca or call ext. 46947. Call stipends entries are due 30 days following the month in which the call was worked. To submit your calls, please visit https://hhsstipend.hhsc.ca/. For more information on call stipends (types of call, due dates, maximums), please visit the PARO website. If you have any questions about your stipends, please contact resorient@hhsc.ca. Call rooms are available weekdays from 4:00 p.m. – return key by 9:00 a.m. – and weekends from 12:00 p.m. (MUMC), 1:00 p.m. (HGH & JH) – return key by 9:00 a.m. Note: Please remove all personal items when vacating the call room. Failure to return a key will result in a $150 replacement charge. Lockers are available for day use only. Lockers at the Hamilton General are located on Level 0, Room 12 (code is same as call room area). For lockers at the Juravinski and McMaster sites, please contact your program. If you have any questions about these items, please contact the PGME Office at pgmeres@mcmaster.ca. Our referral library contains a comprehensive list of requisition and referral forms.